...and I think this summer it's hit everyone of us that we are clearly in a period of rising temperatures, and this is changing the way we live. 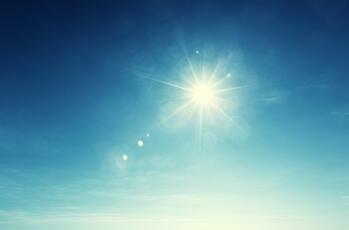 We will have to get used to climate extremes and hot summers, less rainfall, flash floods and thunderstorms. Yet just three years ago in Paris (December 2015) almost every country (196) took the solemn commitment to enact measures to reduce emissions to the atmosphere causing climate change, known as greenhouse gases (GHGs). These derive from the burning of fossil fuels mainly (emitting CO2) but also from other sources such as rotting waste in landfills and dairy farming causing the emissions of methane gas. 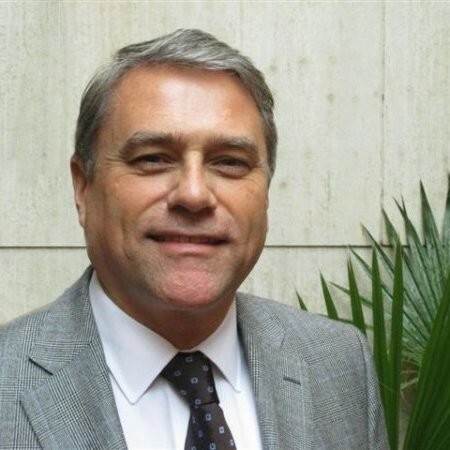 Specifically, the commitment is to ensure that the average global temperature in the year 2100 does not exceed a rise of 2C on pre-industrial levels with a commitment to strive for a 1.5C target as optimal. By 2020 every treaty member has to submit to the climate change secretariat the description of the instruments and measures it will implement in order to meet the targets it has for national emissions reductions and therefore each nation’s contribution to reducing global emissions. These are called INDCs, Intended Nationally Determined Contributions. Therefore by 2020 we will know what each country will do to reduce its emissions and we will be able to map out expected emissions, expected temperature increases, expected investments in technologies and expected growth of renewable energy consumption, among others. 2020 is around the corner so I thought it interesting to look now at where we are in terms of adopting renewables, moving away from GHG emissions caused by burning fossil fuels. 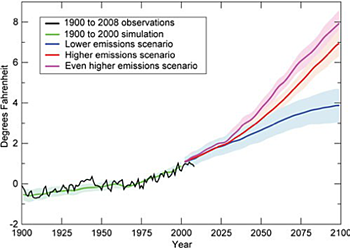 If we are going to meet the target of a maximum rise of 2C, then we need to implement dramatic reduction measures immediately. This is where we are now. It is pretty frightening. 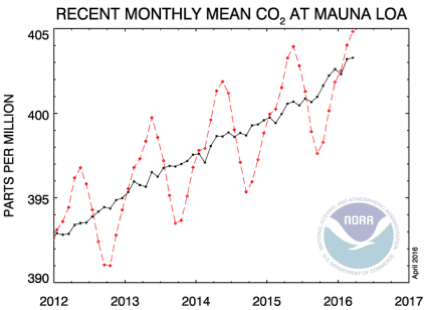 We have just surpassed the level of CO2 in the atmosphere we believed to be safe, 400 ppm (parts per million), up from 300 ppm a century ago as measured by the US government at their Hawaii research centre. 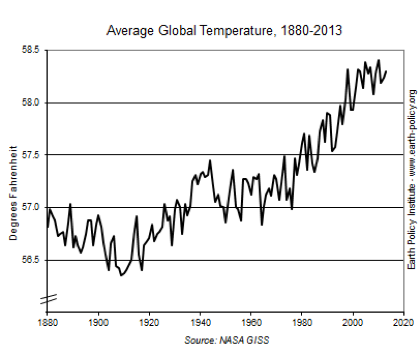 Average global temperatures are steadily increasing, as measured by NASA and the rise is becoming quicker. 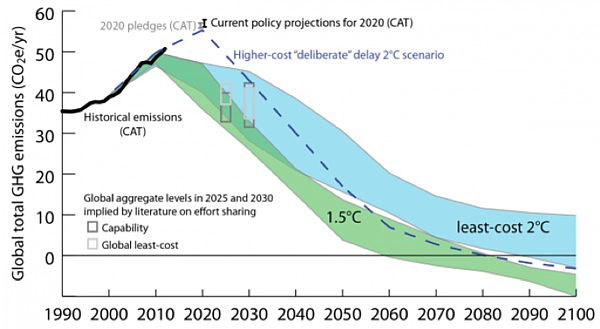 Here is where the International Panel on Climate Change thinks we are heading with scenarios depending upon the commitments submitted in 2020. Their best bet is that the global average temperature in 2100 will be 4C higher than pre-industrial levels and in a worst case scenario, 8C. 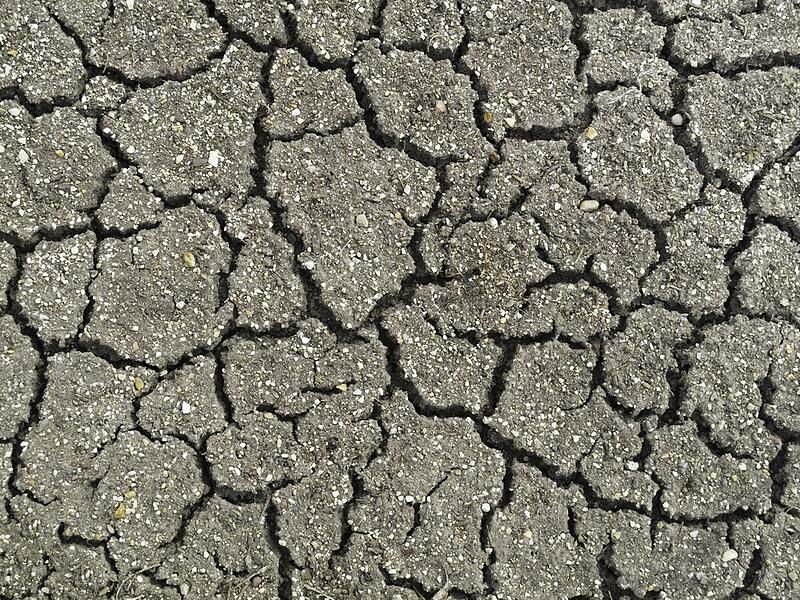 To put 8C in context, 6C higher would make the planet hotter than at any time in the last 55 million years and would mean the end of most of humanity and other species – in other words, mass extinction. 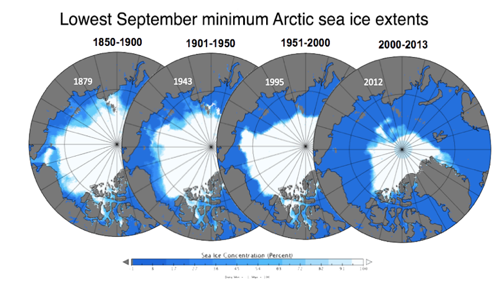 As you can see from the melting Artic ice cap, the reality of climate change is with us now. While renewable, clean energy use grows, as you can see fossil fuel use is growing faster, locking in more long-term emissions. Don't be. All is not lost. Humanity has shown with the Montreal Protocol on the emissions of ozone depleting gases that we are capable of making international agreements that function and can make the planet a better place to live. But for sure, the time we have is very short to turn the tables and keep those temperature increases to less than 2C. As natural gas and biogas from the treatment of biodegradable wastes, emit less CO2 per unit of energy they give; the transformation of energy production using gas is one way we can cut emissions quickly. This is a transitional phase from high to low carbon economies, because even these emissions need to be eliminated, eventually. The US as well as the UK are among those going through the coal/oil to gas transition now. Around a quarter of US energy production comes from natural gas, mainly due to low cost shale gas sources discovered over the last two decades. 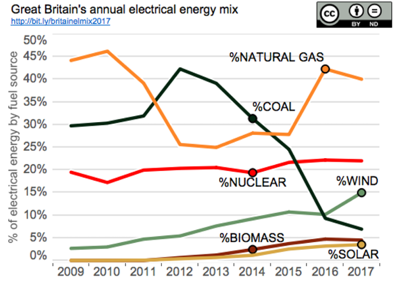 The UK produced energy without coal for a few days this last year, for the first time in its history. 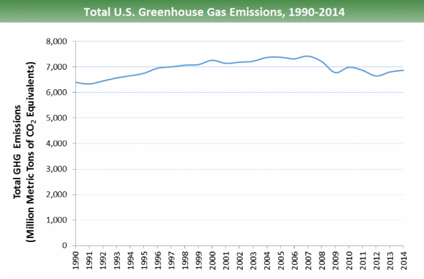 As you can see below, this contributed to stabilising and slightly falling emissions in the US. And steady reductions in the UK, though it wasn’t the only factor. Clearly using renewable non-fossil fuel energy is the way to zero emissions – electricity produced from solar power, wind turbines, hydropower, biomass, natural thermal sources, wave power and so on, brings us not only lower emissions but cleaner air quality. Yet the costs of renewables have been higher than fossil fuels, which have enjoyed economic subsidies and political support for the status quo. So renewables still only produce around 20% of world energy needs. 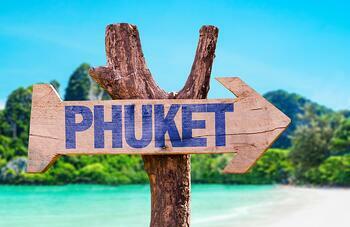 There is a long way to go but not a lot of time to get there. 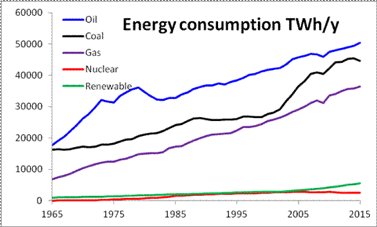 We are using energy more efficiently, as this graph (below) from the US shows. Whether we measure heat efficiency in homes, fuel consumption by cars, energy used per product of consumer goods, energy consumed by appliances, we have succeeded in cutting consumption per unit of most of our daily needs. The problem is, we are a growing population and so the overall use of energy increases whilst the unit use of energy declines. 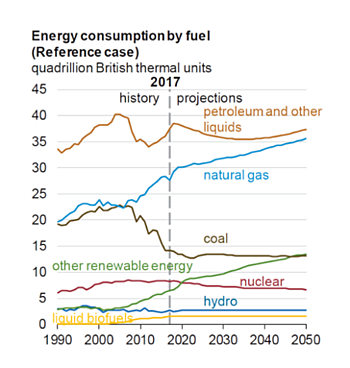 As population booms in developing countries where energy needs have to be met (and where current consumption is very low compared to the UK and US) even greater increases in efficiency will be needed to maintain overall energy consumption growth within the Paris Agreement targets. The job trees do is to soak up carbon – a tree is a carbon storage unit. When we cut it and burn it we release carbon into the atmosphere and we reduce the ability of forests to soak up more carbon. By planting trees, reforesting vast areas, we can soak up some of that carbon we have in the atmosphere. This is not as hare-brained as it sounds. 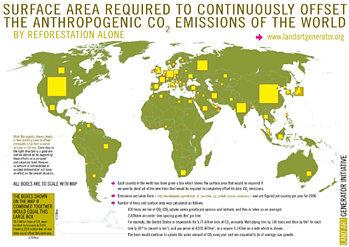 The projection shown here gives us an idea of how much, or in reality how little, we need to reforest in order to continuously offset human CO2 emissions globally. 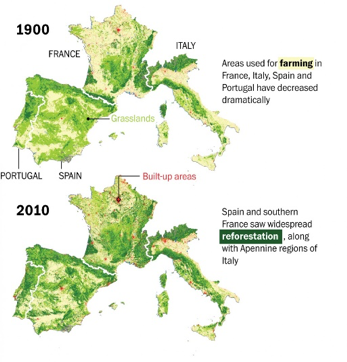 And there is some good news as the maps of Portugal, Spain, France and Italy show – reforestation is happening, just not quickly enough and not over as big an area as we need. China is planting billions of trees. But tropical rainforests are being destroyed to make way for farming. This has to stop too. Plant trees now! The are many others to add (battery storage, CO2 capture and storage, vegetarian diets, waste recycling; are important contributors to reducing CO2 emissions) because I risk writing a book rather than a blog! Let me leave you with one final graph. 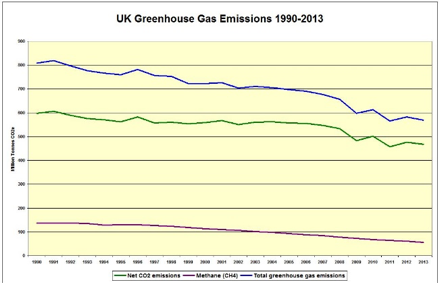 It shows the sort of cuts in emissions we need to implement now if we want to stay within the 1.5C-2.0C rise. The time to think has run out. The time for debate is over. The time now is for action and implementation. Or we will all be in trouble and remember, 2100 is within the lifetime of someone born today. What world do you want that baby to inherit?